The lure of geothermal systems is attractive: clean, efficient heating and cooling and minuscule monthly energy bills compared to traditional air-handling methods. Hooking consumers, however, isn’t always so easy. It’s at least becoming easier, thanks to an array of incentives – from the federal government to local municipalities to electric companies – aimed at making geothermal more financially enticing. 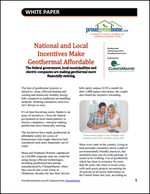 This white paper, sponsored by ClimateMaster, looks at some of the local and national geothermal incentives (see below) and how you can check what is available in your region.